New from designer, Mary Koval is Colorwall. 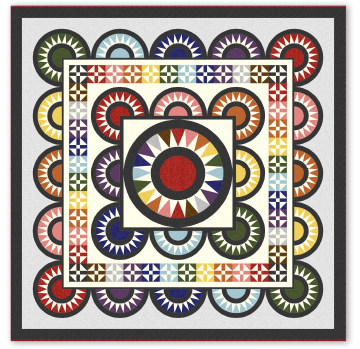 This group of blenders is Windham�s latest basics line and contains 12 different prints in 53 colors. Add them in to quilts in progress or start with a brand new scrappy quilt to really make the most of this group. If colors are missing from your color wall, be sure to check out Colorwall so you can fill in those holes! There is a curated assortment available for order that will ship the collection in 3 parts. See your materials for additional information. 53 skus. On sale April 2018. Delivery to stores August 2018. Pattern has been updated as of 3-08-19. The changes included: yardage requirements and cutting instructions for Fabric G. Fabric G now requires a total of 5 yards of fabric. In addition to previous cutting instructions, for Border #2, cut (20) of Template #8. Please contact info@baumtextile.com if you have any questions.